While on routine patrol, John Cabrelli, a decorated law enforcement officer, is dispatched to a disturbance call. The tense situation requires all of his skill and experience get things under control. Then tragedy strikes, an innocent victim dies, and many lives are forever changed. 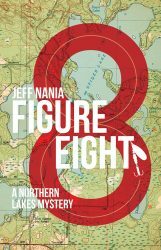 While struggling to pull himself out of the depths of despair, John is notified that he is heir to his aunt and uncle’s cabin on a lake where he spent much of his youth. His return to Wisconsin’s Northwoods brings healing and a sense of peace long forgotten. Little does John know that danger is waiting for him in the north country and he will be forced to hit it head on. Things change and circumstances dictated a career change. The lifelong outdoorsman began in-depth exploration of our natural resources. It led him to a new career founding and leading the Wisconsin Waterfowl Association Wetland Restoration Field Team, restoring hundreds of wetlands across the state. Through this work, he became nationally recognized as one of the pioneers in the ecosystem-based approach to restoration. He was named by Outdoor Life Magazine as one of the nation’s 25 most influential conservationists, was Wisconsin Wildlife Federation’s Conservationist of the Year, and has received the National Wetlands Award, Leopold Restoration Award, and Wisconsin Outdoor News Lifetime Achievement Award. Jeff recognized that loss of connection between kids and the outdoors was a national crisis and began to donate his energy to restoring that connection. Teaming with others, he developed Outdoor Adventure Days, an interactive outdoor classroom experience giving over 8,700 children a wet and muddy day in the field. Building on this foundation Jeff co-founded one of the first environmentally-focused charter schools with teacher Victoria Rydberg, and together, they brought this “hands on, feet wet” philosophy to teachers and students across Wisconsin. Jeff is semi-retired and writes for Wisconsin Outdoor News and other publications. Living on his farm in central Wisconsin, he spends as much time as possible outdoors. He can be often found with his family fishing muskies or snorkeling for treasure on Spider Lake.